If any video game character has the right to be angry, it’s oft-maligned platformer hero Bubsy. Thanks to the power of ROM hacking, the bobcat mascot finally has an appropriate outlet for his righteous rage. Before his first game, Bubsy in Claws Encounters of the Furred Kind, came out for the Super Nintendo and Sega Genesis in 1993, Accolade’s bobcat hero was heralded as the next Sonic the Hedgehog or Super Mario. The game got above average reviews, but a series of fumbled sequels tarnished what little goodwill the first game had garnered. The final Bubsy game, Bubsy 3D for the PlayStation, is one of the worst games of all time. ROM hacker Metal 64 takes the mishandled mascot and puts him in a much better game (via Tiny Cartridge), Sega’s Streets of Rage 2 for the Genesis. If only this had happened for real, Bubsy might have lived on. 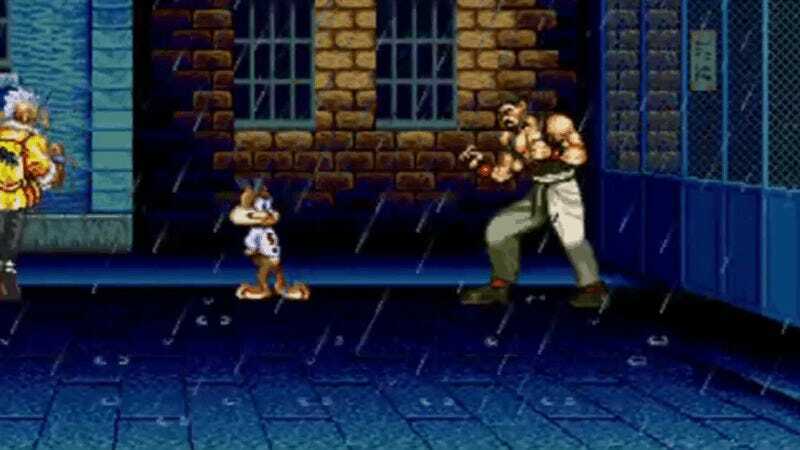 Check out Metal64's page at ROMHacking.net for more clever character injections for Streets of Rage 2, including The Flash, Max from Sam & Max and The Tick.